Editor’s Note (4/22/18): The Steak Shack has moved again. Another location opened inside the CITGO on Lancaster Avenue in Reading. The Sinking Spring location has now closed and the Lancaster Avenue location is now the flagship. Editor’s Note: The Steak Shack has moved. 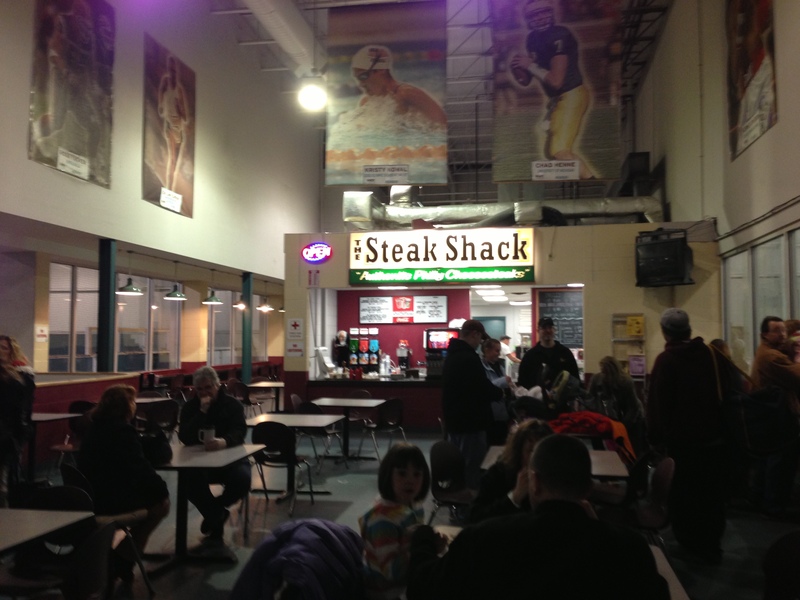 A second location, in the parking lot of the former Surefine Market in Sinking Spring, was opened in 2013 and is now serving as The Steak Shack’s flagship location. For some restaurants, it’s the location that makes it special, like a country restaurant with a riverside view. For others, it’s the ambiance: a rustic inn with Victorian furnishings or an upscale wine bar with chic modern style. When the Steak Shack opened three years ago, it was, quite literally, a shack. The small wooden structure was set in a parking lot along Route 61 in Leesport. Surrounded on one side by a roadside flower stand, and a utility shed salesman on the other, the location was less than ideal. So last year the Steak Shack packed up and moved inside Body Zone Sports & Wellness Complex, just off Route 222 on Paper Mill Road. Now instead of watching cars pass by on the highway, you can enjoy your dinner while watching amateur hour on one of Body Zone’s ice rinks. The view is great, if you enjoy middle age Mennonite men trying to play ice hockey in jeans. But while the Steak Shack has always lacked in ambiance and location, it has always delivered on the two things that matter most: food and service. With my tail between my legs, I returned to the counter with four $1 bills and $2 in change, all that I had on my person. This above-and-beyond personal service can only be found in small, local establishments, and it’s one of the reasons that I am loyal to the Steak Shack. The other reason is just as important: the food. 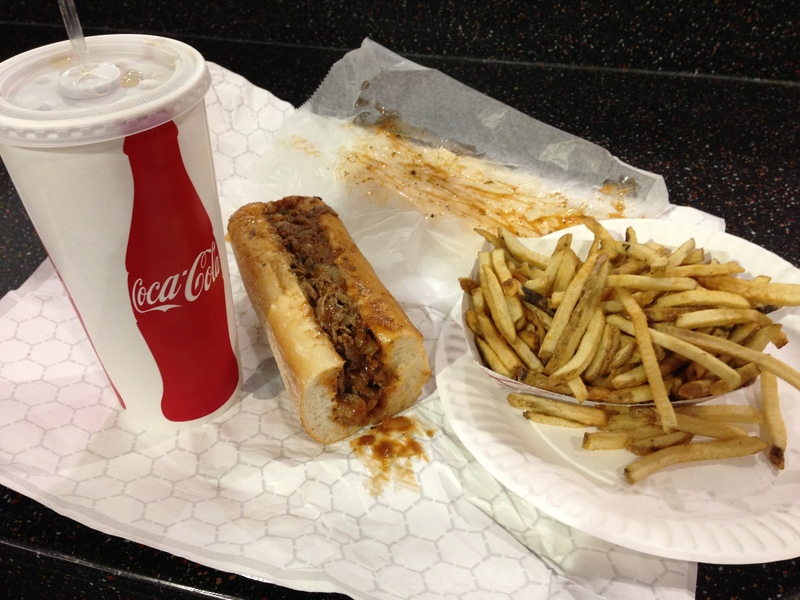 The sign proclaims “Authentic Philly Cheesesteaks,” and that’s what the Steak Shack delivers. The meat is sliced thin, and cooked to perfection. Rather than choose from the selection of cheeses (American, Swiss, Provolone, American Whiz or Cheddar Whiz), I took my steak sandwich with sauce and onion. There’s something about the Steak Shack’s sauce that just blends well with the other ingredients. The sauce is the perfect texture – not thick like a marinara sauce, but thick enough that it doesn’t run out of the roll. And the roll itself is ideal: soft on the inside, but with a crunch on the outside so it’s sturdy enough to hold everything together until you’re finished. Then there are the fries. At Leesport they were short, thick “race track” fries, but now they’re cut thin like fast food restaurants. But the flavor is still the same – a fresh-cut flavor with a little grease. Add a little vinegar and the fries reach a whole new level. Other menu items at the Shack include chicken cheesesteaks, homemade potato chips, and New York style pizza with over 25 available toppings. When another customer asked about the chicken cheesesteaks, the owner summed up why the Shack is the best. “We use real chicken, not that processed stuff,” he said. “If you don’t like it, I’ll give you your money back.” The Steak Shack takes pride in its food, and it has a lot to be proud of. The Shack is open seven days a week for lunch and dinner. Just remember to bring cash. Even if the ATM is working, it’s a $2.50 surcharge. Just added new tools to the sidebar to make it easier to follow my blog. Thanks!